Wembley Innovation developed a means of reinforcing large blockwork walls to eliminate the use of wind posts. 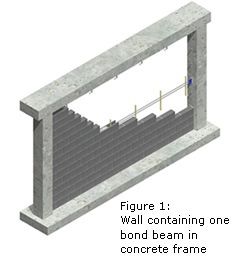 The system consists of a horizontally reinforced blockwork course (a bond beam), at intervals up the height of the wall, so as to subdivide the wall into a number of smaller vertically spanning panels (see Figure 1). The motivation for the development was that wind posts were relatively difficult to install and there seemed to be a tendency to use them at ever closer horizontal spacing, which inevitably pushed up costs. The client enlisted Lucideon to develop a series of tests to determine the strength of walls constructed with bond beams and to compare these to walls constructed using wind posts. Initially four walls containing bond beams, each 8m long and 5m high, were tested. The walls were built within a steel frame and the reinforcing bars fitted into simple cleats attached to the columns at each end. Two further walls containing wind posts at the wall centre line were tested for comparison purposes. Initial results were very encouraging but the designs were deliberately conservative in that extra fixings and some bed joint reinforcement were used. A second similar phase was carried out where these conservative measures were not taken. The results were similarly encouraging, with a slight improvement in the case of the bond beams. There was no evidence of cracking due to shrinkage. The design approach for the sub-panels between the bond beams is straightforward and follows the principles of EN 1996-1-1 and PD 6697. However, design of the bond beams to BS 5628-2 proved to be more difficult, and the check against a sudden compression failure, which is incorporated in BS 5628-2, controlled the design and led to span limitations. There was no sign of sudden compression failure in any of the tests, and consequently a series of tests on low height walls were undertaken, to determine some limiting bending moments that could be used for design. From the four tests carried out, the lowest result was used to define a maximum ultimate bending moment, for use in design and hence a serviceability check was not required. The specification of materials, design and execution were all brought together in a Design Guide, which was published by Lucideon in 2009 (then Ceram). The first significant application of the bond beam system was in a large data centre constructed in South East England, it was an ideal use for the bond beam system as it featured long, uncomplicated runs of high walls, loaded by a moderately high lateral load. The centre was constructed as a robust two storey steel and concrete ‘bunker’ built entirely within a large steel framed building. The interior was broken down into smaller rooms, with a requirement that a fire or explosion in any room did not spread into the adjacent areas. The solution adopted for constructing the walls was to use long runs of 140 thick block walls, with a design lateral loading of 0.5 kN/m2. These walls were typically 6m high, and the original design featured bed joint reinforcement in every course plus 200 x 200 square hollow section wind posts at maximum 4.5m centres. The total amount of blockwork used was 11,000m2. The introduction of bond beams substantially increased the allowable span of the walls, eliminating many interim wind posts, although some wind posts were still required adjacent to doorways and on unusual spans. The masonry contractor reported that the use of the bond beam system achieved cost savings of approximately 15% over a traditional wind post system. Whilst the bond beams allowed for a much wider spacing of wind posts, it was not possible to entirely omit them. The next step was to investigate a vertical version of the bond beam. Column tests were carried out on what were essentially locally reinforced hollow blockwork. In each case, two vertical steel bars were used in a single voided block. The completed system now consists of both beams and columns, shear transfer rods, cleats to fix reinforcing bars to building columns, and to the vertical bars in the columns. All of the details, together with the limiting moments to be used for both beams and columns were included in a revised design guide. there were large amounts of large services distributed at high level in the spaces, creating many penetrations through the full height walls. In designing the Aquatics Centre masonry, the strength added by introducing bond beams meant that the walls were able to span significantly further than the recommended spacing of movement joints. In order to avoid this limitation, it was necessary to introduce bed joint reinforcement. The subdivision of large blockwork walls subjected to high lateral loads can be achieved without the extensive use of wind posts. The combination of the design of the subpanels using Code Guidance and a ‘design by test’ approach for the bond beams and columns has enabled an ultimate limit sate design approach to be developed, without the need for serviceability checks. Throughout the test programme progressive improvements were made to the components of the system. The system was used very successfully on the complex 2012 Aquatics Centre project. The masonry contractor reported that the block walls were erected faster and cheaper than using comparable traditional systems. This project demonstrated the value of the system for applications with long or high walls with significant lateral loads. Further investigation lead to improved guidance on the provision of effects of shrinkage.